Tire blowouts are a frightening form of equipment failure that can easily lead to very serious car accident injuries. Tire Blowout Accidents and Liability Blowouts are dangerous because they can cause drivers to lose control of the vehicle. Parts of the tire can also scatter and create road debris that poses a safety hazard for other motorists. During a tire blowout, the best course of action is to avoid slamming on the brakes and keep the steering wheel steady while you use the vehicle's gears and natural deceleration to reduce your speed. When you are able to come to a stop, turn on your emergency lights before changing the tire yourself or calling for help. Driver. Drivers are expected to regularly monitor and inspect their vehicles to make sure they are safe to drive. If they find a problem, they have an obligation to avoid driving until the issue has been fixed. Manufacturer. Manufacturers can be liable for tire blowout accidents if there is a problem in the construction of the tire that increased the risk of tire failure. Retailer. Knowingly selling tires that are unsafe creates a liability for accidents that result. Installer. If you paid someone to install your tires and they did not see a flaw that should have been noticeable, they can be held liable for your damages. 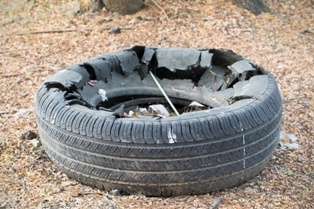 If you have suffered injuries in an accident caused by a tire blowout, you may be able to seek compensation for your medical expenses, lost wages, and pain and suffering. Your attorney can help you locate the evidence necessary to build a strong case. Contact the experienced personal injury attorneys with Inland Empire Law Group at (888) 694-3529 to schedule a free, no-obligation consultation to discuss your legal options.